Through the first decade, the Coady’s campus-based education program modeled the existing programs of the Extension Department, drawing heavily from the principles and methods of the Antigonish Movement. 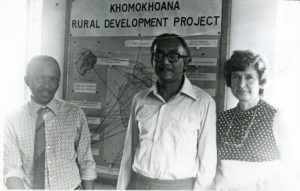 The basic courses were the Philosophy and Principles of Co-operation, Co-operative Service Organizations, Economics, Communications, Community Development, and fieldwork projects and assignments. Students qualified for diplomas by passing their exams and completing a major essay that proposed how the principles they had learned would be applied in their home country. Dr. A.A. MacDonald later assessed the approach of the time this way: “Integration of adult education methods with the organization of cooperative enterprise constituted the main development strategy. Underlying this strategy was the strong moral commitment to the achievement of a socially just society in which the human potential of the common people could be fully realized.” He added that this human capacity approach was distinct from development thought elsewhere that emphasized industrial development, and contributed to the Coady’s popularity. The early curriculum extended over an eight-month period paralleling the regular academic year at the university. Later, international students arrived in the spring and graduated from the diploma program on St.F.X. Day, December 3. The founding staff of the Coady numbered only four full-time persons: Smyth, director; J. Frank Glasgow, assistant director; George Wicks, registrar and house manager; and Ellen Arsenault, secretary. Glasgow had been an inspector of schools in Cape Breton, Wicks had worked with Smyth in Ottawa, while Arsenault had been Coady’s secretary from 1947 to 1959. Sr. Marie Michael MacKinnon joined as the Institute’s first librarian in 1964. Members of the St.F.X. faculty were key to the Coady’s innovative programming. These professors and lecturers, drawn largely from the Extension Department and social sciences faculty, possessed considerable adult education experience and provided educational resources and expertise. The Coady relied heavily on them to fulfill its mandate. The Coady’s work was as varied as its students and included much more than merely lecturing and training. For example, in 1961, staff sent out 216 packages of literature and information to 53 countries. Two men were assigned to Latin American projects, just as another staff member returned from an African assignment. Inadequate resources prevented the Coady staff from satisfying requests from many countries. The five staff commonly attended conferences and short courses in places like Europe, Mexico, Central America, the US and Canada. A CBC radio program publicized the work of the institute while a sequel to the National Film Board’s documentary, The Rising Tide, highlighted the Institute’s program of studies. Moreover, an annual summer school was offered in July for 30-40 students, and a new 12-month Junior Assistants Training Program was soon launched to prepare students for work as directors of extension programs abroad. 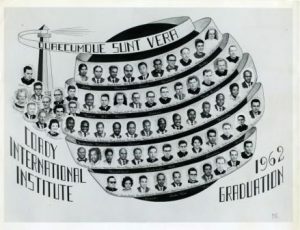 The men and women students came from 90 countries, mostly in Africa, Southeast Asia, Latin America, and the Caribbean. Foreign students were required to have a working knowledge of English. 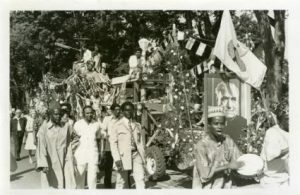 The students came from community development backgrounds and occupations; they were missionaries, teachers, youth workers, nurses, co-operative employees and government administrators. Enrolments climbed until 1965, leveling off to around 80-90 per year by the early 1970s. Between 1959 and 1970, 753 students completed the flagship eight-month social leadership program and 491 the summer short courses. Thirty percent were clerics or sisters, 80 percent were male, and most were from rural villages. The students–one-third of them lived off campus–added a dash of cosmopolitan flavor to the small town atmosphere of mid-1960’s Antigonish. On-campus residence facilities expanded with the completion of International House in 1965 and MacNeil House in 1969. Eight months of exposure to sociology, economy, nutrition and education, journalism and management, group techniques and accounting, etc. Mostly, though, exposure to one another. Hesitation and tension, right and wrong words, minor clashes and major differences in interests, backgrounds, plans. Unformulated-hopes, vague and distant. Homesickness, dreams of home, dislike of strange foods. But also, discovery: of a person behind a face, of kindness in one word, of understanding the same point at the same time, of puzzling the same question, of sharing into humanity, of accepting differences and a community emerging. This shared experience also propelled graduates to form regional associations. Father Smyth’s directorship ended in 1970. He had been an indefatigable fundraiser and efficient founding director, logging countless trips across hundreds of countries while also championing the Institute internally at St.F.X. The Coady’s relationship with its parent organization, the Extension Department, was sometimes complicated by differing conceptions about their respective roles. Occasionally, administrators called for the rationalization of the two programs into one, but the two remained organizationally and physically separate. Smyth’s replacement was Father George Topshee, a long-time staff member of the Extension Department. Father Topshee remained director until 1979 at which time Dr. A.A. MacDonald assumed the position. From the founding of the Institute in 1959, required fieldwork brought thousands of Coady students to surrounding communities, such as Mabou, Canso and Cheticamp, where they saw firsthand rural credit unions, co-operative stores and producers cooperatives such as canneries, dairies and grading stations and wholesalers. Simultaneously, these mature students were encouraged to reach out and share their experiences and ideas with local organizations. Every year they accepted invitations to address audiences at high schools, fraternal associations, and churches. A highlight of Antigonish’s annual Highland Games parade was the Coady float as students added colour and flare alongside the pipe bands and fire trucks. They also visited other parts of Canada. 1982 marked the tenth year Coady students organized a Central Canada field trip to explore the larger urban centres and consult with public and private development agencies. The staff had grown from four in 1960 to eighteen full-time teaching, administrative and secretarial members ten years later. In 1972, attendance declined to 47 after peaking at 80 just two years earlier, but averaged about 54 for the rest of the decade. In the mid-1980’s, attendance fluctuated upwards again to a decadal average of 60. By 1979-80, the program of studies included eight major elements. The core course of studies was still diploma program in social development. However, that program now offered students a choice between two sub-programs: a community studies program and a co-operative studies program. Courses on Adult Education Methods, Philosophy and Methods of the Antigonish Movement, and Theories of Economic Development were common to both programs while each sub-program had specialized content. Five elective courses for both were also offered. Students were still required to complete a major independent study project related to their professional fieldwork. The Coady always provided many other learning opportunities in addition to the main diploma program. These could change over time, depending on available staff resources and expertise. For example, in 1979-80, it offered two, on-campus, five-week summer certificate programs in training methodology and credit union development. Other short courses–an overseas seminar program, a consultancy and evaluation program, program identification, and a development centres consultation program-–were offered in various international locations. Finally, the Coady offered a Canadian conferences and meetings program. While the calendar of on-campus programs and international seminars and short course was frequently updated, the core emphasis on the values and techniques of the Antigonish Movement remained central to the modern Coady.